Vehicle Entry is at the North end of Main Street. Enter from Chapel Street - Clinton Street or North Main Street. Registration includes a Cruisin’ Night Commemorative T-Shirt and Dash Plaque for the first 100 registrants (size XL). Additional Shirts are available for purchase online at yatesny.com. Vehicles must be street legal. 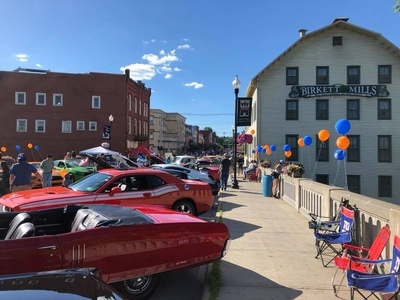 All vehicles must sign-in between 4:00 and 6:00pm at the North end of Main Street in front of the Post Office to receive your registration packet. All vehicles will be parked diagonally, by an event team member, for the event with the front end facing the center of the street. No parking for the event prior to 4:00pm. Vehicles will remain in their designated spaces until 9:30pm for safety reasons. Vehicles are parked on a first-come, first-served basis. If you would like to park as a group, you must come as a group. For safety reasons, the following items are prohibited: glass containers, bicycles, skates, skateboards, or similar items.